The picture above is what you can get for $30 in today’s experience-seeking culture. 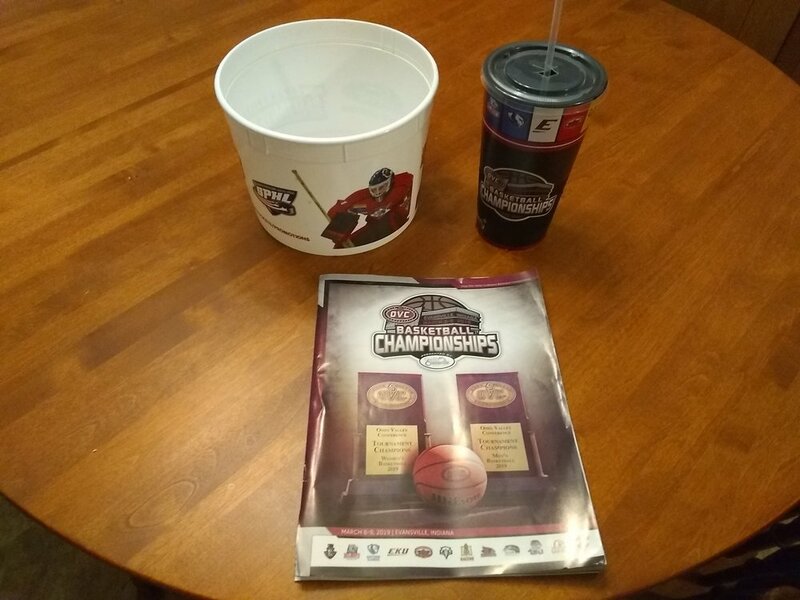 All I have from the event is someone else’s half emptied drink, an empty popcorn bucket, and a worn out brochure. Last week, Ja Morant lead Murray State and over 10,000 fans, including Los Angeles Lakers Hall of Famer and Executive Magic Johnson, into the Ford Center in Evansville, IN. People wanted to see Ja’s explosiveness and playmaking ability against other tough competition. Sitting next to a Murray St. alumnus on one side and a basketball enthusiast on the other, I enjoyed the game. The majority of the demographic in the stadium was wearing blue and yellow rather than red. The sounds of the game were typical to any basketball game I have watched at any level: booing at the referees, enjoying overpriced snacks, and celebrating your team’s successes. The timer hit zero to indicate an end to both the scoring and the spending. Ja Morant had accomplished his task of leading his team to score more points than the opposition. The Ford Center had accomplished its task of allowing its patrons the opportunity to leave with less money than when they entered. The only question remaining: did the patrons accomplish their task of the end justifying the means? Was the excitement of the game worth the cost of gas, tickets, a hotel room, and snacks? Many people spent way more money than the $30 I spent. Was one night worth $30? Was it worth more? My first place of employment was the international missions department at the General Baptist headquarters. We tried raising support: emotional, spiritual, physical, and, most commonly, financial. We sought large one-time donations for regular fundraisers and disaster relief, recruited paying members of short-term mission teams, and promoted our monthly share support program. Within this program, you could do your part in supporting a missionary, child, or student, from many countries throughout the world. My next place of employment was a General Baptist church plant in Cookeville, TN. We attempted to raise emotional awareness and financial support of Cookeville residents and General Baptist short-term volunteers around the country. Both one-time and monthly donations were greatly appreciated. My next place of employment at a traditional General Baptist church in Evansville, IN (this one!) is no different than the previous two. Financial and emotional support is a must. However, how do you encourage someone to support your cause? For Ja Morant, you have to demonstrate talent and potential. How do you do that for churches? Why are we willing to leave a stadium with an empty bucket and a worn out program, thinking our night was worth it, but if the pastor asks for money, then we question his motives? We sacrifice potential giving opportunities of love, justice, and hope for one night flings of excitement. Instead of embracing the marriage of hope in Jesus Christ, we seek pleasure from the world for one night only. To be clear, I am in this same boat: I was there at the game. Then, this week, I went to a Christian comedian’s performance here in town. I am not saying I live a life under a rock. I am saying we need to make sure we are putting our treasure in the right place, “For where your treasure is, there your heart will be also” (Matthew 6:21 NIV). If we place our treasure in the hands of the temporal world, then that is where our hearts will be. If we place our treasure in the hands of an eternal Father, then that is where our hearts will be. In the race against time, I want the hands of my clock to be in the hands of the creator and sustainer of all things. Click here, http://generalbaptist.com/international-missions/the-americas, to learn more about GBIM and how you can help.